SO, WHAT sort of sentence do you think a man convicted of killing someone by smashing in his skull with a stone might get in Indonesia? Life? Thirty years in prison? Twenty? Five? No. Three months, apparently. 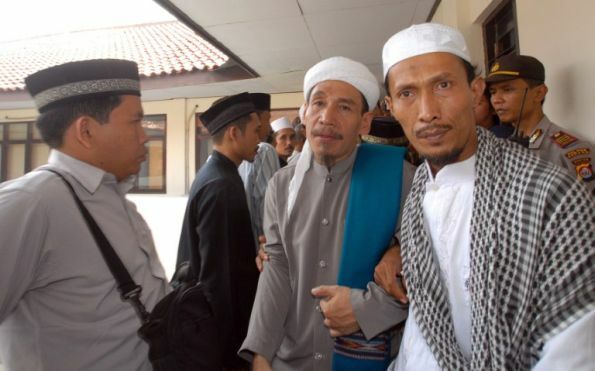 At least, that was the sentence handed down by a court in Java on July 28th against Dani bin Misra. He was part of a frenzied mob of Sunni Muslim chauvinists, about 1,000 strong, that hacked and beat to death three members of the minority Ahmadi sect of Islam in February. Eleven others were on trial (including the cleric pictured above, white turban on the left). None of the guilty received more than six months for their crimes; none of them were even accused of murder. The ringleader was convicted of nothing more terrible than illegal possession of a machete; he got just over five months. Considering the horror of the killings, these verdicts were risible and have been condemned as such by all and sundry—human-rights groups, the American government (which usually leans over backwards to be nice towards its new friend and the world’s largest Muslim country), the EU, as well as Indonesian civil-rights organisations. It’s a terrible verdict for Indonesia, and for Indonesian justice. On the subject of religious tolerance—and the related matter of Islamic terrorism—it’s as if the country always takes two steps forwards and then quickly takes another step back. A few weeks ago a court finally sentenced one of the country’s most culpable terrorist leaders to a meaningful prison sentence; now another court gives these perpetrators nothing more than a slap on the wrist for what was clearly an awful murder. Furthermore, no one could have been in any doubt as to the savagery and barbarity of the attack on the Ahmadis; it was all caught on film and posted (temporarily) on YouTube. In theory the rights of the Ahmadis to freedom of worship and expression should be protected by the country’s constitution, like everyone else’s. But the government has partly gone along with the more extremist Muslims who wanted the sect banned completely; as a result, the sect has been stranded in a legal twilight zone. Many have argued that this invites attacks on the sect; these latest verdicts also point in that direction. The present government wants to be known as progressive and democratic at home and abroad—putting the Suharto years behind it, as it were—but that aspiration will remain well out of reach unless it does a great deal more to protect vulnerable minorities within its own borders.